If you want to learn more about art and think tagging paintings for the public’s benefit might be a fun and charitable way to spend an hour or so, head on over to Your Paintings Tagger hosted by the Public Catalogue Foundation. I signed up today and the experience is kind of like being an art sleuth. It’s an exercise in image association, if you’re into that sort of thing. Essentially, you focus on a painting and pick out four distinct categories to tag: things/ideas, people, places, and events. 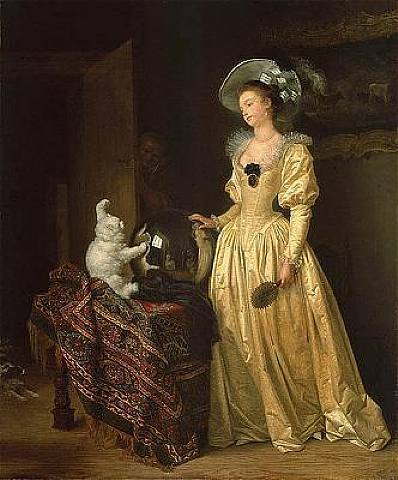 It’s really as simple as looking at the following painting and typing in tags such as lady, white angora cat, mirrored globe, spaniel, pale yellow gown, etc. Although it’s helpful, you don’t need to know anything about art to participate. Your tags are run through an algorithm that determines appropriateness so need to worry about tagging incorrectly. It, apparently, is smarter than you or me!